Several months back I reviewed the Everyday Messenger Bag from Peak Designs. The Kickstarter sensation has been out for a couple of years and after months of testing, I was convinced that it was one killer bag that I still use daily. Over the last couple of months, I’ve been checking out the latest in the Peak Design arsenal, the Everyday Backpack. Although it borrows a lot of tricks from the Messenger Bag, it too is one special bag. Peak Design's most voluminous bags yet, both 20L and 30L versions carry a very complete pro photography setup. If you’re at all familiar with the Everyday Messenger Bag, then you have a general sense of what the design aesthetic of Everyday Backpack is. I reviewed the Charcoal versions of both the Messenger Bag and Backpack, and both are stunning. The majority of the bag is in beautiful hard charcoal material with hints of silver, red and black. Before I deep dive into the design, let me just say this is one gorgeous bag. 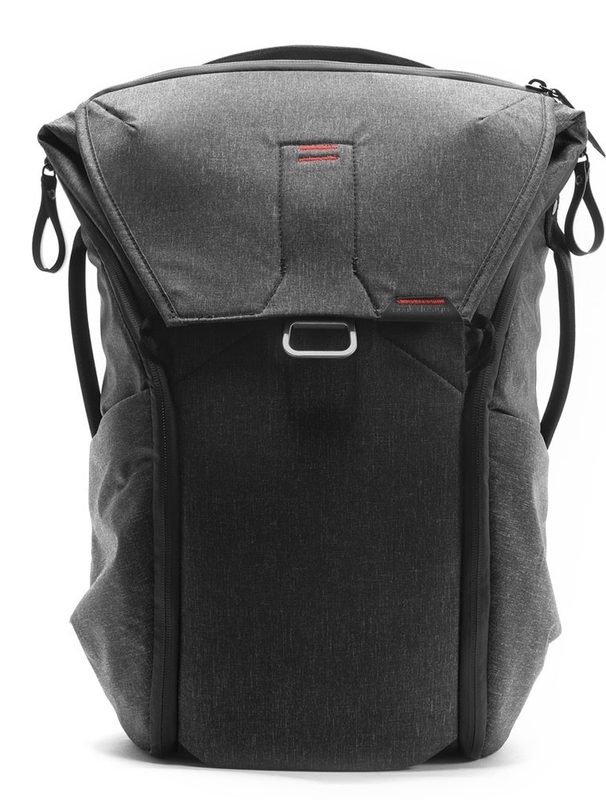 More so than the Messenger Bag, the Everyday Backpack has a feature-rich design. The general design philosophy seems to be optionality without sacrificing design. There are a ton of straps and latches hidden in various pockets. If you want to strap something to back of the exterior of the bag, you have lots of options to do that. And when you’re not using the straps, they all will hide away nicely with no one being the wiser that they exist. There are two main compartments of the Everday Backpack. The first which is housed in a waterproof zipper has two separate pouches. One pouch would be for a tablet and another for a laptop. As someone who carries my iPad Pro and MacBook Air with me almost everywhere, these two separated pockets are nice to have. There’s plenty of padding so I never was worried about the safety of those devices. Then there’s the main compartment within that houses the bulk of the volume of the bag. There are three ways to get into the main compartment. The main entry point is on the top with the Peak Design Mag Latch which uses magnets to open and close. It sounds like a pain but once you use the Mag Latch, it couldn't be easier. Then, on either side of the bag there are full access points that allow you to quickly get into the bag from the side. On both sides, entries are storage pouches that make for perfect places to throw your extra batteries, cables, and the like. Within the main pouch, you have three FlexFold dividers, allowing you to break up the bag into more compartments to stay organized. I love being organized, so I used two of them breaking my main compartment of my bag into three distinct sections. A super-useful tool to be able to customize your bag to meet your organizational needs. Over the last couple of months, I’ve sidelined my Messenger Bag and have been exclusively using the Everyday Backpack. I usually only use a backpack when I’m traveling, but thought since I was going to put this bag through its paces, then I’d need to see if it could be an everyday bag. There are two sizes of backpack, 20L and 30L, and I chose to go with the 30L for this review, and am glad I did. Although the 30L looks a little big on my 5’6 frame, it has the flexibility I need on a day to day basis. Most days I’m probably only using half of the bag's space, but there have been a handful of times when having space to throw my jacket and some extra gear in has been helpful. From a pure comfort standpoint, the Everyday Backpack is stellar. It’s funny that at first I was worried that the straps seemed a little thin. After a couple of days, though, I actually found that the padding is so expertly spread throughout the bag that it's an incredibly comfortable bag to carry even when it's fully loaded. There are also enough straps and entry points that you can easily throw one strap off your shoulder to grab something within the bag and be back on your way within seconds. In the time I’ve been testing the Everyday Backpack, my favorite feature is using the FlexFold dividers to organize my bag. On days that I’m going to workout after work, I can throw a second divider in and keep my clothes in one section and my charging cords in another. On days where I’m just going for a quick meeting or to work in a coffee shop, I can make a small compartment for my essentials and keep the rest of the bag wide open. It allows so much more flexibility than a typical backpack. Another small feature that blew me away was the small security addition to the backpack. All of the zippers have the ability to attach to over a small latch that stops someone who’s quickly trying to unzip and grab something from your bag. It’s not super-secure but it’s an extra level of security that I wasn’t expecting. Day to day use of the Everyday Backpack has been a joy. Although we don't get much rain here in Southern California, I was never worried about rain ruining anything in the backpack. Although the bag is not submergible, Peak Design has made some smart decisions to make it as weather resistant as possible. It's also an incredibly comfortable bag to carry. Even when I packed it full to the brim, there's a great weight distribution in it, making the bag easy to carry for long walks. I adored the Everyday Messenger Bag, but I think I love the Everyday Backpack just a little bit more. The backpack is jam-packed with features, all of which are well thought out, without taking away from the bag's stunning design. Just like the Everyday Messenger Bag, the Everyday Backpack is both functional, but also serves as a conversation piece. It’s a stunning bag inside and out, and despite being a bit pricey, if you’re looking for a bag to carry your gaming and tech gear safely while also looking stylish, I can’t recommend the Everyday Backpack higher. As long though as you’re not hiking with the Solo Rival it should do plenty to keep everything as safe as possible. For me though, the Solo Rival has so many nice small touches that I don’t see me using any other bag for travel anytime soon.